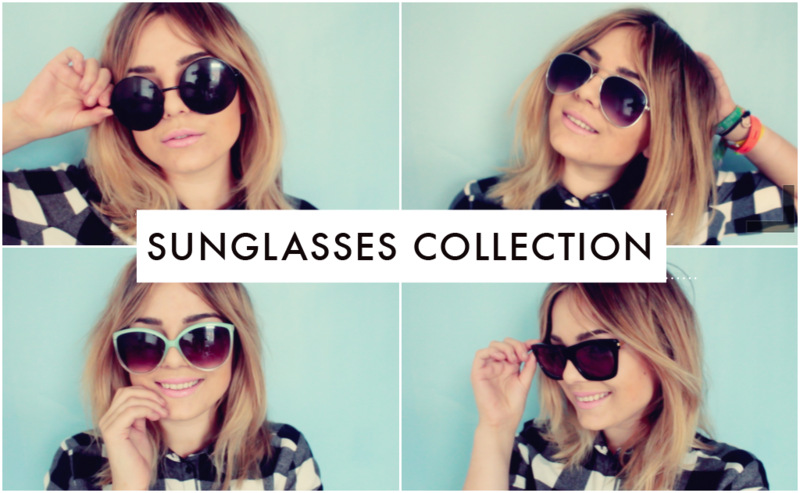 A few days ago I decided to make this little video showing my favourite sunglasses collection in for the form of a little poppy fun video. I actually taped some blue wrapping paper to my bedroom wall and hoped for the best! And voila! Im pretty happy with how it came out overall in the end as I love the tone! I really want to make some more little fun videos like this as I find them much more enjoyable to make that sit down and chat videos! Let me know if there is anything else you'd like to see! New Look are so on point for summery, festival fashions and you've proved this point with your gorgeous video, loving all your picks! Great video! The mint green Primark ones are my favourite, i'm really loving that colour at the moment! I looovveeee the primark ones! Gorgeous shape! Well I defiantly need to get some new sunglasses! I love sunglasses way to much, you have a lovely collection! Gosh, you have some beautiful sunglasses! ha this is such a cool post! hardly ever see things like this! Love these! I obsess though over sunglasses and maybe purses like some women do shoes. lol. Zero UV and the Primark ones are my favorite of yours! I love that shade of blue. Perfect summer color. Great video, and by that I mean editing and stuff really caught my attention unlike some reviewer videos. Your big round ebay numbers are such classic melrose! I love, love, LOVE the video! It's so fun and fresh. You have some gorgeous glasses! I really like the fact that you tried something fresh and different, Lily! I think the video looks fab, and I'd definitely encourage you to do more like this. It's also great for people in a bit of a rush who don't have time to watch a sit-down-and-chat haul video but still want a summary. You could do a similar style video with different summery lipstick shades and eye shadows. Love your collection. You pull off all of those styles very well! Such a fun video! I loved your editing. Damn it! You beat me too it. I was planning on doing a Sunglasses blog post - I too have quite a collection. This video is so cute and such a great idea! Super cute sunnies! Fingers crossed the sun stays out! You have been nailing it on the editing front at the moment, such a refreshing change to see! What fab collection you have! Such an incredible and fantastic video! WELL DONE! All of your sunglasses look so pretty and stylish!